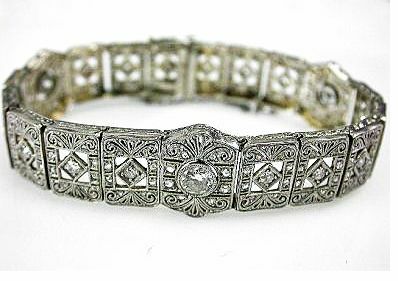 A beautiful 18kt white gold vintage Art Deco filigree bracelet with 3 old European cut diamonds, etc. 1.22ct (clarity: SI2 & G-H colour); 16 single cut diamonds, est. 0.54ct (clarity: VS-SI & G-H colour) and 152 rose cut diamonds, est. 0.48ct (clarity: VS-SI & G-H colour). It is approx. 6.75 inches (17.145cm) long.